Over the weekend, we had a chance to open up our beehive again and we were very happy to see that things are progressing nicely! We observed a good pattern of healthy, capped brood and lots of multi-colored pollen. We weren't able to locate the queen, but the presence of capped brood is a good sign that she is laying and doing her job well. The bees had drawn out comb on seven of the ten frames, so it was already time to put on a second deep hive body to give them more room to expand. After taking off the outer cover and hive top feeder, we saw there was quite a bit of burr comb on top of the frames, so David scraped the excess comb off using the hive tool so that he could get to the frames more easily. We are saving all of the bits of comb that we scrape off along the way so that we can melt it down to render the wax for all sorts of things like candles and lip balm! The first time we opened up the hive the bees seemed more than a little agitated at our interruption. I was really scared to be honest, so I stayed back while David did all the work. This visit went much more smoothly, and I actually got up close and checked out the frames. I was the designated smoker while David pulled out each frame for us to examine. The bees were definitely more calm this time around, probably because they have had time to get used to their new environment and also because we used more smoke. All in all, we were pleased and felt really good after this inspection! After everything was closed up, I had a chance to reflect on the visit to the hive and make an entry in our bee book. We thought it would be a good idea to keep a bee journal and write down our observations from each visit to the hive. As beginning beekeepers, I think this will really help us to understand our hive more and it will serve us for years to come. It will be a great resource to look back on and help us plan for future years of beekeeping. After this successful inspection, I can't wait to get into the hive again and take a closer look. Maybe I'll even do some of the heavy lifting next time around and let David be the smoker! PS - My friend Cindy over at Old Time Farmhouse has featured our homestead today on this month's Farm Fresh Feature! I am was so excited to have this opportunity and I think the post turned out really well. I'd appreciate it if you would hop over to Cindy's blog and check it out. You can view the post by clicking here. Thanks so much for your support! yay for a happy, healthy hive! Sounds like it's going well - that's great! Looks like the bees are getting situated to their new home--that's great! I also went over the read your Feature!! It was great, love the questions and answers! Hi Tammy! Getting bees is on my list of things to do when we get a larger place. The comb you got is beautiful. What a great idea to keep a journal! Tammy, I love that in addition to honey, you can also make your own candles and lip balm! Very cool! Congrats on the feature, too! I love this... truly fascinating to read. I love that I can live vicariously through you! Great idea to keep a journal on the progress of the hive. Smart! I'm looking forward to hearing more about your bee experience! I really want to add bees to our homestead but I admit that I am a bit intimidated by the concept of handling that many bees. The more information I get the more at ease I'm sure I will be. It also appears to be quite an expensive venture and I am looking for pointers on doing it on a budget. Hopefully soon! It looks like you are doing wonderfully at beekeeping! I love to read about all this process! I was surprised to see all that burr comb already! I'm off to see your feature. So happy to have found your wonderful blog through Cindy's feature. I think beekeeping is so fascinating. Looks so exciting! I hope for the best!! WooHoo for healthy bees! And a bee journal is a great idea! We'll have to try that too! Glad things are going well!!! I have two new packages of bees arriving, now, on the 18th. Late due to the heavy rains. Best of luck with this venture. I really enjoy having my hives! How exciting! So glad all is well and that you felt more comfortable. It gets easier with practice, like everything else! Can't wait to see what you do with the wax! Love your bee book! I read your guest entry on the blog you linked - awesome! And I'm looking forward to seeing some ducks!! That looks awesome! I think it's fantastic you get to use the wax too. What will you make?! Hi Tammy, I loved your feature on Cindy's blog. Your homestead is wonderful and I loved the pics and the critters are so cute. We met a while back and it was so good to visit once again. Great Bee post. You are blessed to live where you do. Much happiness always. Glad to hear the beekeeping is successful. Thanks for the update. Congrats on the feature AND on doing well with your beekeeping! Sounds like things are going really well for you. Wow! This is amazing that you guys are trying this. I'm not sure I'd do it! I'm glad it's going well. You both look like pros! Tammy, I am so happy that your bee hive is doing well and is getting easier! Have a happy day and week ahead! This is such an interesting thing to follow. I am going to really enjoy learning about the bees. Hi there! Thanks for your comment on my blog! I am so envious of your beekeeping! My husband and I have desired to raise honeybees as well, but we just haven't been able to find the time to research it enough to actually feel comfortable doing it. It seems that a long of young homesteaders on jumping on the honeybee bandwagon! Anyway, I love your blog! Can't wait to have a few minutes to visit more! Oh, and I'm really jealous of the honeycomb! I've been wanting to try some beeswax candles, but if I want to make them, I'll have to buy the beeswax pellets. You can make your own! I am so excited for you and your hive! I hope you will be sharing your wax projects! you have a great blog! i would love to raise chickens in the future and become more self sufficient. but im renting and i dont think the landlord would be too happy about chickens running around his yard. for now i have started vegetable container gardening. Looks like you will have a productive and healthy hive! yay! things are moving right along! You two are doing great with this! You don't need to see the queen, as you know, but in time that will get easier. I find it easiest to look for her movement. She walks purposefully and steadily across the frames. Is your queen marked? Did you see eggs? I had my contact lens prescription amended this year because I'm losing my close vision (old age!) and all of sudden I'm finding it MUCH easier to see eggs in cells! ALso very good to be cleaning up burr comb every time you go in. That stuff builds up fast, as does propolis. I have one hive that just goes NUT making propolis. THere are actually two large hardened pools of it down by the hive entrance. 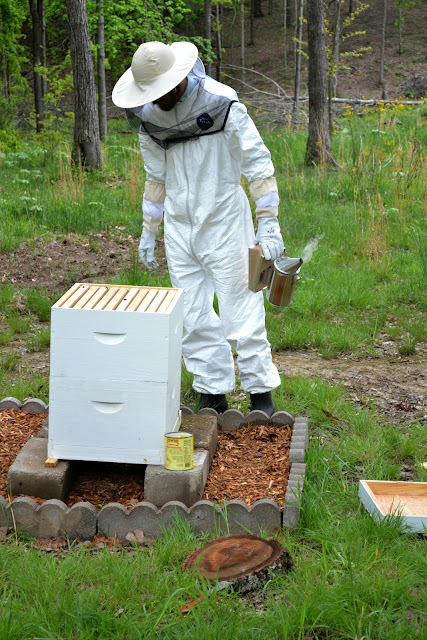 Over time, as you get more confident, you will be able to use less smoke when working the hives. Less is definitely more, although that said, there are some days when you just need to smoke the heck out of the girls (like the days when they are cranky and feisty.) Sometimes my mentor opens the hive without using any smoke. One thing that is important, if you don't know already, is to give the smoke a couple of minutes to take effect before opening things up. A lot of beekeepers don't wait after putting a few puffs across the front entrance, but I do and I think it makes a difference. I also crack the inner cover and give them a little shot, then put the cover back down and give the girls a minute or two. That allows time for the message to circulate through the hive. Also it's an excellent idea to keep notes! I've filled a couple of notebooks now and the records are invaluable. Keep doing that! I even note the weather conditions, what's in bloom, etc. Have fun! You're doing great.